This is a simple Crystal oscillator circuit using 74LS04. It provides a square wave of 1MHz to 10MHz. Using an inverter gate IC and controls output frequencies with crystal. I will show you with two circuit ideas below. The oscillators or frequency generators provide a waveform out in various forms. For example, sine wave, Triangular waveform, and square wave. They generate the frequencies to be a base time. To control an electronic circuit. The crystal oscillator circuit like this get a popular uses in digitals. a resistor and a capacitor in RC oscillator circuit. Using crystal to joint with the resistor. In the circuit below is the simple oscillator that generate the square wave or DC pulse. They match the crystal and two resistors. To working instead of the RC network circuit. Then, Look at this circuit. Use the crystal of 1MHz to 10MHz. And the resistors from 1K to 4.7K. Both resistors R1 and R2 must be same resistance. They can generate the output constant frequency of 1MHz to 10 MHz. It depends on that crystal. Though the stability of this output frequency has slight defects. Because its temperature changes while working. Which it affect to the capacity within the crystal and making frequency tolerances. But it has very less value. When compare with the common oscillators. That uses RC or LC network. Next, look at a power supply. 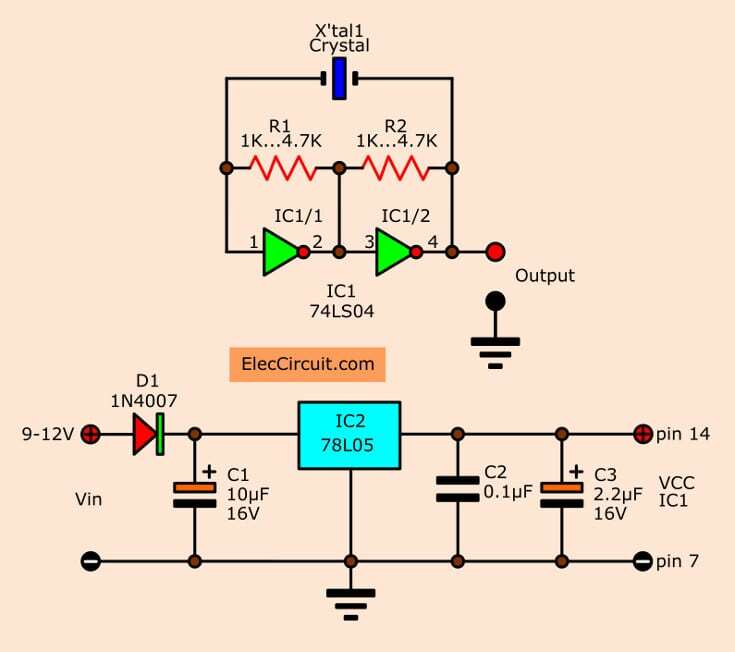 This circuit uses a low current consumption and constant power supply of 5V. Using DCV supply of 9-12 volts comes to DC regulator IC2-78L05. To keep output to A steady voltage. There are capacitor C1 and C3 filter current to smooth. Then, C2 pull a high frequency that contamination from power supply to ground. And protect Interference that may occur to the circuit. For IC1 may be LS, HC or HCT types. You can make easily this circuit on the universal PCB as Figure. I like the TTL crystal oscillator circuit. Because it is good and enjoyable. It just the signal status “1” and “0” only.And frequency generator is a circuit that I like. However, when studying the TTL IC., Which is the basis of a digital circuit that everyone should learn it. Although it can be tricky about power supply to 5V fixed and high current consumption. It can be used with very high frequency. When we need a highly accurate, it uses the crystal frequency control better. This are simple and cheap crystal oscillator circuit, that we use a few parts comprises a TTL digital number SN7404 or SN74LS04 (Package contains six inverters), four resistors and a crystal. The tree inverters gate are biased into their linear regions by R1 to R4, and the crystal provides the feedback. Oscillation can only occur at the crystals basic frequency, for example, we need frequency is 2MHz, we chose crystals as a 2 MHZ. The output signal has form is Square wave Oscillator at 5Volt p-p.
We test they on breadboard. We use a 3.579545 MHz crystal then measure frequency output show on LED display highly accurate. I was trying to find the solution for non working of similar circuit made with SN7400, as used in one of reputed working instrument. Your circuit is similar to existing problematic circuit except IC SN7404. Both are not oscillating to any frequency, tried with all version of TTL logic. Can you pl explain the reason and solution for it.Will be obliged for solution through email. if i want to generate 1 Mhz square wave. what are the crystal oscillator, value of R1 and R2 that i should use. Is this design will give out square wave directly? please can you guys provide voltage divider formula and formula for frequency in the output.